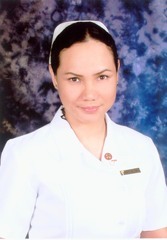 Information: I passed both national boards, conducted by the Philippine Regulations Commission, Midwifery and Nursing. Currently doing volunteership at the Mindanao Regional Hospital, Zamboanga City Medical Center. Message: For any additional information please do contact me through my email address.. Hobbies & Interests: ARTS, ARTS & CRAFTS, Painting, Sketching, Cooking, Health, Flowers, Nature, Life.